"Behold the Watcher" (Brubaker/Pulido) - Regular Captain America scribe gets to flex his sci-fi muscles in this framing sequence, illustrated in a very Ditkoesque fashion by Javier Pulido. While at first this sequence seems to be a mere means to an end, with a heretofore unseen group of aliens (?) monitoring what the Watcher sees, in truth this story may be yet another prologue. Not bad, but pretty vanilla. It does what framing sequences are good at: needlessly linking together unrelated stories. Skip It. Nova in "Harbinger" (Loeb/McGuinness/Vines) - Kid Nova's back, and he's got bad news--first for Terrax, former Herald of Galactus, then for the cosmos! In all honesty, Richard Ryder is as much an adult as any in Marvel's stable, but McGuinness' redesign makes him look like he's about ten years old. The big draw in this story is the return of a certain entity from the X-Men's side of the Marvel U, and I have to say "It's about time." I also have to say I bet we can't take this apparent resurrection at face value. 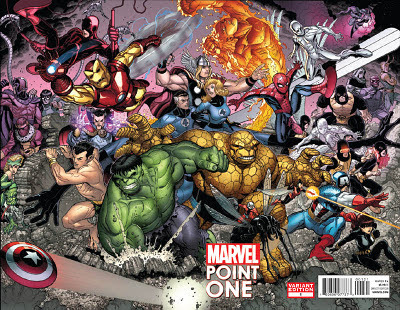 (Remember that the cosmic end of Marvel has been embroiled in a war with the "Cancerverse"!) It's a big, bombastic hint, but since the bad guys bite it in this one, does that really engender sympathy? All the recent cosmic sagas seem to run together and this one appears no different. Skip It. Age of Apocalypse in "The Myth of Man" (Lapham/De La Torre) - In a world of mutants, how do you define humanity? That's the question behind this story, a primer for a series wholly set in the "Age of Apocalypse" universe of the 1990s. It's the first nineties revival in these pages but not the last. Lapham's script accentuates the dark subject matter, and De La Torre's scratchy linework evokes Bill Sienkiewicz--miles away from his work on Ms. Marvel. The identities of the X-Terminated are interesting to anyone well versed in X-history, but if you're looking for new-reader-friendly, this isn't it. Skip It. Scarlet Spider in "The Scarlet Thread" (Yost/Stegman/Babinski) - Marvel brings back another dour nineties character here, just as in the previous story, but this time the results are much brighter. Easily the strongest story to come out of Point One, this spidery saga's all about redemption. Kaine, the failed Spider-Clone, gets a new lease on life courtesy his "brother" Peter Parker, as seen in the "Spider-Island" crossover event these last few months. Now, he takes on a role that is, on the surface, evocative of the other "brother" he hated, the late Ben Reilly. In just eight pages, Yost and Stegman show that this is the Kaine I remember, and they give him a radical new life situation I'm just aching to find out more about. Easy for new readers to pick up on, with stylish art, this story's the first real reason to pick up this book and Buy It. Coldmoon & Dragonfire in "Yin & Yang" (Van Lente/Larroca) -The first story in this volume to not be beholden to previously introduced concepts in the Marvel Universe, "Yin & Yang" spotlights a pair of wondrous twins who grew up separated in a research facility but now find themselves united. They team up to stop the villainous corporation that kept them apart, or so the cliche goes. The core concept is clear enough, but I think this superhero saga is still baking. I do have faith in Van Lente, however, and Larroca seems to be easing away from the photorealism that's been a distraction in his work of late. We'll split the difference and say Read It. Dr. Strange in "The Shaman of Greenwich Village" (Fraction/Dodson/Dodson) - One of the most criminally under-represented heroes in the Marvel pantheon, Stephen Strange takes the spotlight in this story only to act as lead-in to the new Defenders series. Strange has always investigated paranormal phenomena, and here Matt Fraction gives a glimpse into the magician's next great challenge with aplomb. While I'm not sure that the Dodsons are a good fit for a series primarily focused on the mystical, I can't say this isn't one gorgeous looking story. If you've been vexed by the depiction of Strange in other prologues for the new series, this one may change your mind. Buy It. Avengers in "Age of Ultron" (Bendis/Hitch/Neary) - Bryan Hitch and Paul Neary have their art run through some digital filters to make it look like everything's shaking, and we get yet another hideous vision of the future that's built on that timeline Brian Michael Bendis came up with in the new Avengers series. It's clear that the Avengers are this year's X-Men, complete with apocalyptic, "Days of Future Past"-style visions. If you've seen it before in Uncanny X-Men, don't bother: it's still the same. Burn It. Overall Ranking: 2.57...we'll round that up to a "Read It." In the vein of their previous effort, Action Philosophers, Fred Van Lente and Ryan Dunlavey put their formidable talents together to establish the definitive history of comic books, and did it in comic book format! This is the sixth and final issue of the series, and features three stories exploring different facets of the comic book industry. If Van Lente and Dunlavey's purpose was to inform, then they succeeded in spades, because while I've researched the history of comics' direct market and the advent of digital distribution, the full history of the graphic novel (which didn't...totally...begin with Will Eisner) and the genesis of the Japanese Manga movement were largely unknown to me. Van Lente took pains in researching various philosophy movements in Action Philosophers and he's done it again here, with a depth and breadth of knowledge that may at first seem overwhelming. (It's definitely a comic that you'll digest over the course of an hour, if not more, and you'll find yourself coming back to it again and again.) Dunlavey is a match for every concept thrown at him, slickly including gags both subtle and not so much, as well as just telling the stories. If you don't know the history of the direct market, you'll doubtless find that story the most worthwhile story in this collection, but there's a lot to learn besides. For a long time, the Japanese Manga movement has outpaced the American comics scene, and through an analysis of talents including Osamu Tezuka and his many works, you'll learn why. You'll also learn the perils of filing graphic novels in the bookstore when no such format previously existed en masse. 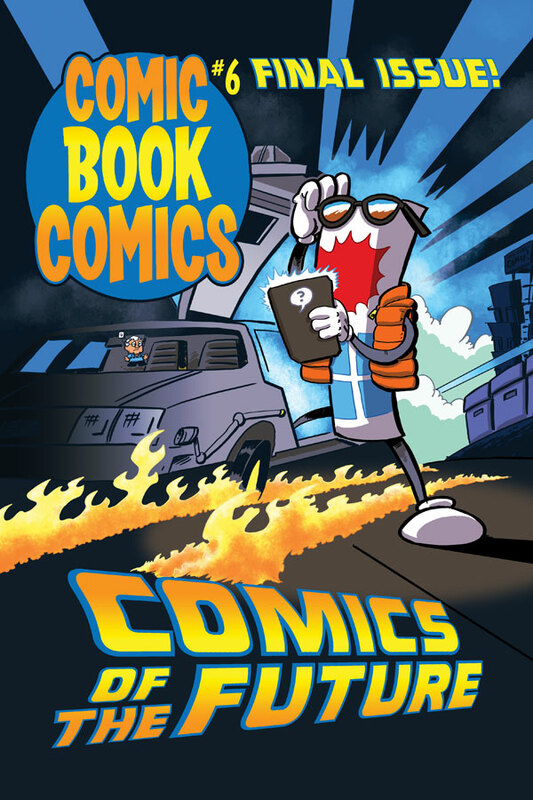 Just as in their previous work, Van Lente and Dunlavey have succeeded in producing an educational product that everyone reading or working in comics should read. That's no cheap hype; it's the simple truth. Although I've only read this, the final issue, you can bet I'll be rushing to purchase the back issues, and/or a graphic novel collection. Or maybe I'll go digital. Available 11/16/2011 in comic shops and 11/23/2011 on ComiXology digital format. After the first issue of the new Incredible Hulk, I was cautiously optimistic about this new beginning. While Jason Aaron had a great voice for the Hulk, his Bruce Banner seemed like, well, a raving loon. Sure, it was interesting how, split apart, they were still sharing the same facial hair, but I felt the story could go off the cliff at any minute because Banner was heading into Villains-ville, courtesy the Looneytunes Express. Besides that, if the second issue was being solicited when, as Rob Liefeld noted on Twitter, artist Marc Silvestri wasn't even done with the first, and we ended up having another penciler and several inkers in a late-night jam-session for that first story, well, how much would this book suffer? Here we are with "Hulk: Asunder, Part Two," and we've got five pencilers and six inkers struggling to finish a horrendously late book on time so Marc Silvestri can half-finish one more issue and be out the door with another artist taking his place. It's sloppy work no matter who's to blame. 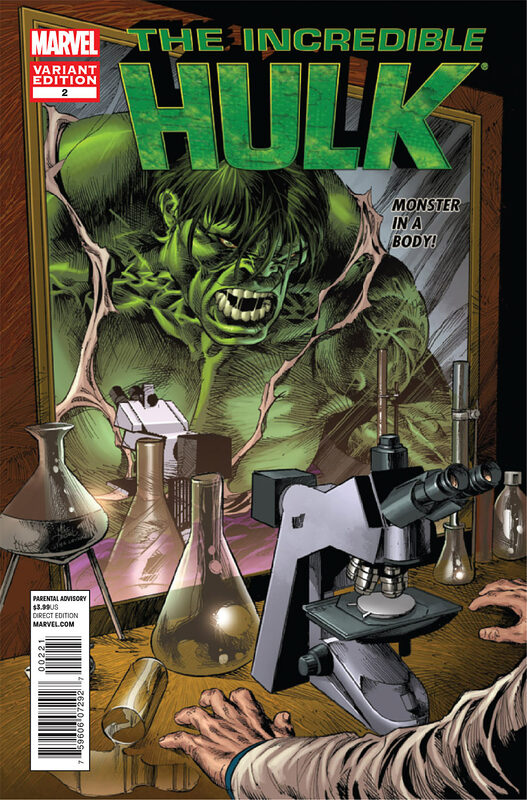 Marvel should give its artists decent lead time, especially in the case of a high-profile relaunch such as this new Incredible Hulk has been. At the same time, an artist should be able to make deadlines without calling in every single helper in his studio. Whoever's at fault, everyone suffers. If readers think it's sloppy work, they'll drop the book, and circulation figures will fall. But, well, three paragraphs in, and I haven't actually said anything about the story, have I? "Hulk falls off cliff. Hulk go boom! Ha ha! Hulk make funny joke!" Good artwork can cover a bad story, but bad artwork only makes a bad story all the more visible. I thought we'd glean a little more insight into the mind of Dr. Robert Bruce Banner, now separated from the titular Green Goliath. It was only natural after producing the previous issue's hook. Now, however, we don't just have suspicions that Banner's gone loopy: we have nine whole pages of around-the-bend behavior from our favorite nuclear physicist. Without the Hulk, it seems our boy's self-confidence has gone the way of the dodo. He's convinced himself that his life is absolutely worthless without the Hulk, and he'll do anything to get him back, including alienate the woman he loves, create monsters right out of The Island of Dr. Moreau, and if he has to, explode a brand new gamma bomb. With such a wrongheaded look into the psychology of Bruce Banner, and an ever-deteriorating artistic situation, this book takes the place of The Weekly World News as my choice of fish-wrapping. In fact, it's not even worth buying to wrap fish in, because it's four whole dollars for only 20 pages of content! Wake me when we again have a single artist (or even one penciler and one inker), and a writer with a vision of Banner and Hulk that makes sense. And if it can be $2.99, let it be $2.99. Available 11/16/2011 in comic shops and on ComiXology digital format. I dropped Hulk right after I heard Portacio was on his way. After reading this, though I am sorry to see the Hulk get so mishandled. Sloppy work.